« Rose Hips: More Things That Look Like Other Things. 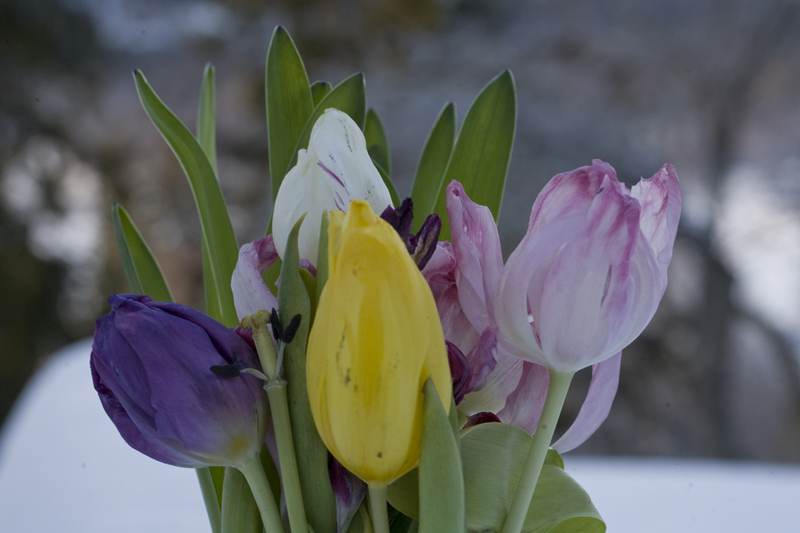 Tulips II: The End? The Beginning Of The End? But still fascinating, in a squiggly way. 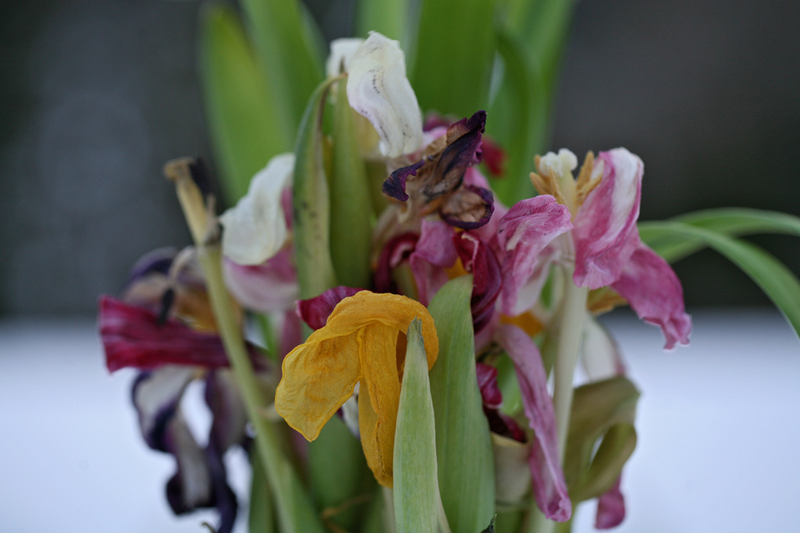 I pick irises and very strange things happen to them. Spring is coming. I will plan to document them. No, we’ve had them for a long time & I enjoy watching things happen. Otherwise we might as well have plastic ones; they can be very realistic. Actually… plastic dead tulips, now there’s an idea. I find things are sometimes at their best when they are past their best. At 38, you haven’t even reached your best yet. The arrange you did of the flower’s colours is an important part of the beauty of this bouquet, past and present. I’m in animal alert: Yin (my two faced cate) is climbed at the top of a pine at my parents. I’m in BA now, but I must get up my daughters and rush to see what happened to her. That’s all my fault for taking her with me all weekend instead of living her behind in our apartment… Sorry, I told you this as a sort of catharsis. Wish us luck! Good luck! I guess they don’t live in BA. It’s true that sometimes they’ll get stuck up trees and become embarrassed that they can’t get down (cats, not your parents). ¡jajaja! yes, they would also be embarrassed (and you can’t imagine how embarrassed would I’ll be…). La Horqueta, where’s my parent’s house, is at more or less 20 km from BA. – Hva ler’ua’? Sa farmora. – Av mormora, den furia! har Farao hatt moro av! That was a poem for children, with a lot of word play that makes it hard to translate, about Farao on holiday climbing a pine tree. André Bjerke. Sorry to have been a stranger (stranger than usual, that is) lately, spare you the medical terms (right after “bone abscess” and “allergic reaction” they start getting even less appealing), but “on the other hand” (!) said condition does yield a special receptiveness to and appreciation of all things withered. Though again I believe, from this evidence, you are weathering your withering a bit better than I have been able to do, over here, or shall I say there, on the withered moor. Even our potted plastic flowers have withered this winter, though perhaps this is merely a sulfa-induced hallucination. But has it stopped raining, Tom? I do hope you’re feeling a bit better soon, it sounds jolly unconfortable. After 24 hours, the cat known as Yin-Yang seizes the floor with her feet again. After being rescued by his human father she expressed “heights aren’t so good after all”, and assured us she “will never ever leave the city again”. A happy ending after all. Her human mother continues feeling herself absolutely guilty, though. “It’s the least she can do”, say all other implicated. Oh, Tom, all you tell us is awful. I hope you’re feeling better now! Wishing you a speedy recovery, Tom. As a matter of fact, Artur, it has indeed stopped raining. For now. A bit of the old false springtime. Where there’s life & c.
And happy here about Y-Y’s safe descent, Julia.